Source: Robert Corbet Singleton and Edwin George Monk, eds., The Anglican Hymn Book. Second Edition. Revised and Enlarged. (London: Novello, Ewer and Co., 1871), No. 52. Translation occurred in 1870. O haste ye, O haste ye, now to Bethlehem! See there the Infant, born the King of Angels! O come let us adore Him, the Christ, the Lord! Hail Him, true God, begotten, not created. Chorus. Now sing all ye blissful sons of Heav'n above! Glory to God be given in the highest! Chorus. Be glory ascribed by all on earth below! Word of the Father, now for man Incarnate! Chorus. 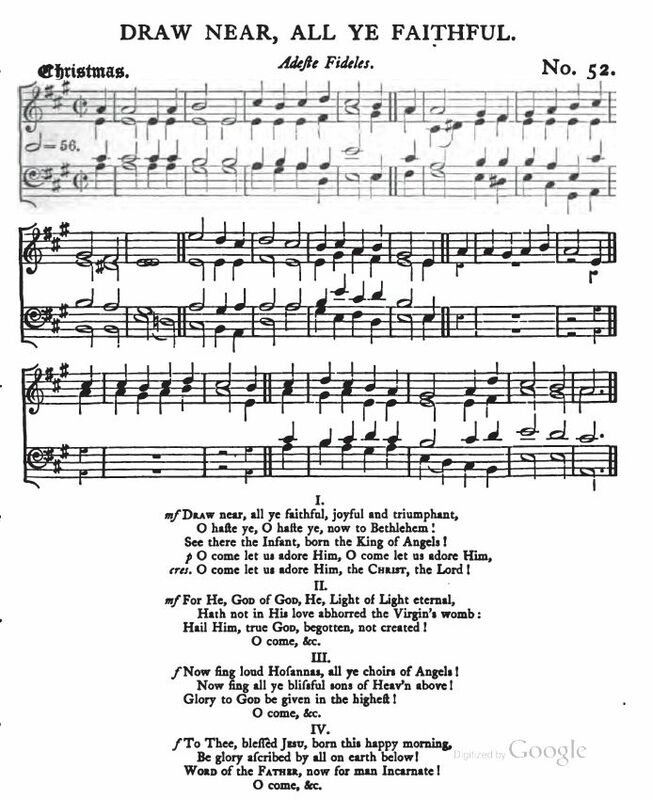 Sheet Music: Robert Corbet Singleton and Edwin George Monk, eds., The Anglican Hymn Book. Second Edition. Revised and Enlarged. (London: Novello, Ewer and Co., 1871), No. 52.